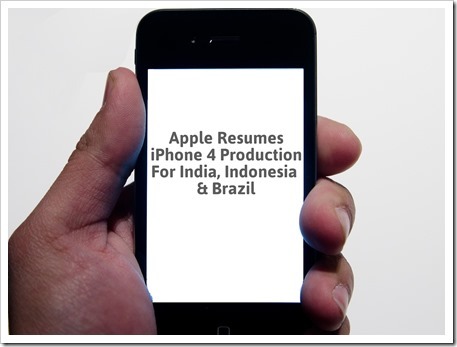 Apple has never done it before – but looking at market conditions and sagging sales, they have broken the tradition and resumed the production of iPhone 4 just for Indian, Indonesia and Brazil reports ET citing Apple senior executives. Till last year, Apple has always had an aura around them as an elite brand that had superior products at highest-pricing-bracket. People flaunted their new iPhones as some kind of prized possession. However, the decisions taken by iPhone over last 12 to 18 months seem to move in opposite direction. To boost sales, they have cut down on the phone prices, launched phones for cheap that are nearly 4 year old. Prior to 2013, Apple did not have India on their radar at all – Infact, they treated India as the dumping ground for their unsold phones. Apple sales never took off in India until recently when they started offering various EMI schemes and price cuts. It seems, Apple is now looking at India differently. They understand it is an important mass market and entry-level phones (like iPhone 4) priced around Rs. 20,000 will do well here and they want capitalize on their iPhone brand, which still is considered very elite in India. For a normal consumer, getting a Apple iPhone 4, with decent specs for Rs. 20k is very appealing and that’s what Apple is targeting with re-launch of their iPhone 4.
iPhone 4 is Apple’s best selling phone in India, however, they had a bad last quarter as iPhone 4 had limited availability, even though the demand was high. Prima facie, It does make good business sense for Apple to resume production of iPhone 4 due to the demand. However, in my personal view, Apple needs to stop rehashing the old models and come up with something new that will not only restore their eroding brand image, but will also convince people (like yours truly) that they have the capability of producing new break-through devices. 6 Indian Mobile Apps That Were Global Success!